Jeffersonville, IN – Eagle Steel Products, Inc, a flat rolled steel distributor and coil processor located near Louisville, KY, has installed a new precision double-loop Turret Head coil slitting & surface inspection line with in-line shape correction capability in its expanded 170,000 square foot barge and rail serviced facility on the Ohio River in Jeffersonville, IN. 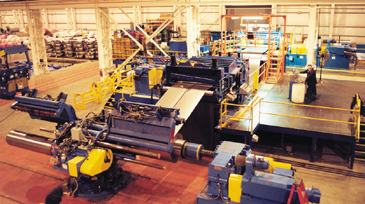 Eagle Steel provides high-quality precision coil slitting, surface inspection, and leveling services for carbon and stainless steel producers, automotive and appliance manufacturers, as well as other OEMs. 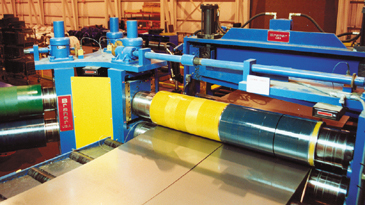 The new Braner/Loopco slitting/inspection line is capable of processing 80,000# x 76" wide surface critical coated steel as well as 300 and 400 series stainless steel coil in gauges from .009" through .187" at speeds to 1,200 FPM. Double-Loop Processing – The line has the ability to process coils in tight line, single loop, and double-loop operating modes. Based upon material, gauge, and duty (surface inspection, edge trim, multi-cut slitting), Eagle Steel can select the operating mode that would produce the best quality and best operating efficiency. 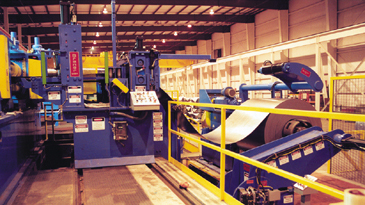 For example, the tight line mode is commonly utilized for edge trimming and surface inspection. Mid-gauge cold rolled is normally processed in the single loop mode, and double-loop is commonly selected for processing light gauge surface critical coil. In the double-loop mode the DC motor driven Uncoiler drives the strip into a free loop ahead of the slitter, causing the strip to be steered and slit under zero back tension conditions. Zero back tension produces tighter slit width tolerances because the strip lays flat into the slitter knives. Zero back tension produces a better quality slit edge because slitter knife slippage is virtually eliminated. Edge trim width can be reduced with zero back tension since the strip can be side guided into the slitter without the fear of rolled-up edges. Higher slitting speeds can be achieved and entry tension induced camber can be eliminated because thin gauge coil "wobble" (coil OD eccentricity) is isolated from the slitter by the free-loop. Turret Head Slitter™ – The Eagle Steel line is equipped with a quick-change Turret Head Slitter with three (3) 9.500" heads. The Turret Head Slitter is easier and faster to re-tool than any other slitter design, and has the added benefit of changing heads in one-minute. A 300 HP DC motor driving the Turret Head Slitter allows single loop slitting of up to 24 cuts in .075" at 1,200 FPM. Surface Inspection – Processing surface critical material often requires that coils be quality inspected for surface defects. The Eagle Steel line is equipped with a surface inspection station equipped with multiple fluorescent lamp banks as well as high-intensity strobe lamps to highlight surface scratches, dents, or other surface defects. Surface defects are visually identified, located, and recorded by an inspector as the coil is processed. In-Line Shape Correction – The Eagle Steel line is equipped with a Cluster Leveler™ capable of eliminating strip shape defects such as center buckle, wavy edges, and cross-bow from the strip. The Cluster Leveler is a corrective roller leveler with adjustable back-ups supporting work rolls that range in size from 3.000" to 1.500". The patented work roll design gives the Cluster Leveler the unique ability to eliminate strip shape defects through the entire .009" to .187" gauge range by applying large or small diameter work rolls to the strip depending on gauge and yield strength. A PLC eliminates leveler set-up trial and error time by making the set-up fully automatic.